Today’s poem was written through my tears. It was a hard climb, like trekking through the Andes, to get the the final line and when I read it to R we both cried. 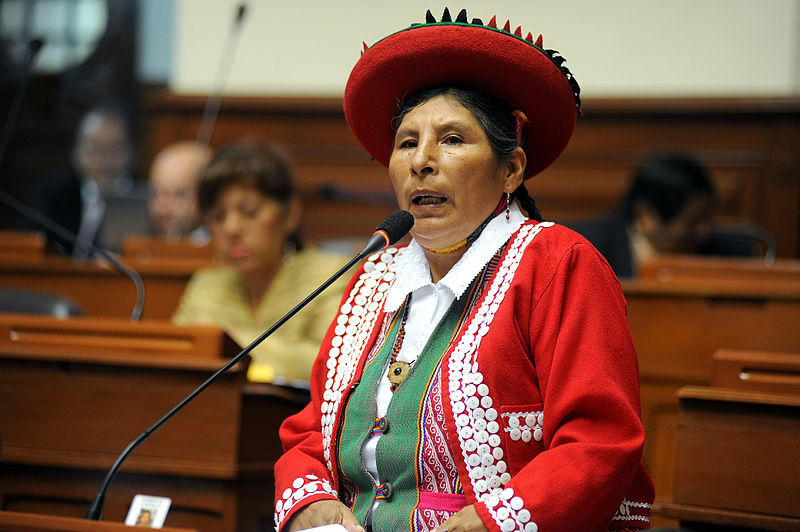 And yet, Hilaria Supa Huamán, known in Peru as “La Supa,” is all about the power of suffering, perseverance and hope. I have tried to honor her in this poem. Here is the link to a video, in Spanish called La Supa Knows (I could not find one for you in English.) if you would like to view her in action. The prompt for Day 19 of NaPoWriMo was to write a poem using or inspired by the name of a shell. One just happened to be “Peruvian Hat.” I knew immediately where I needed to go. Thanks, Dawn, I really appreciate your taking the time to read this poem. Gentle hugs, again. Love your posts… just having trouble catching up on all the good writing I’ve missed the past 2 weeks! This one was really amazing! Thanks, Dawn. Golden milk is quite a find for me and I’m glad you’re sharing it with others. All the best! Very powerful. Thank you for telling this important story through the vehicle, NaPoWriMo. It is good because it feels fresh, not overly polished. Honest. Like. Hi, db. You know how sometimes poetry spews out like lava? This was one of those. Had to be written.Thanks so much for reading my poem. Breathtakingly heartbreaking and beautiful at the same time, a true triumph, dearest Susanissima. Bless you. Bless you, too, love. Did you send me a poem? I will check. Happy Easter! This is such a moving poem. Good work! It feels like a lava-spew. Linda, I’m honored that you read my poem. Thanks so much! Yes, a true spew! Does that happen to you? Wow, powerful stuff! Great poem and amazing story. Thank you so much, Brenda. Can you imagine such a life! All the best. Absolutely! She is a phoenix, and an inspiration. That’s some powerful shizz—and how you wrote it—feels also like you’ve intertwined a tribute to the late G.G. Marquez—the magical threads you’ve woven in coming to life inside my consciousness. Thank you–for pushing those boundaries—helping us find the source where our own tears can be awakened to awaken those parts of us. I’m honored by your words, jd. La Supa is the kind of woman who can push a poet’s boundaries into the stratosphere. As for Gabo, I will write about him after the shock wave of his passing has ebbed a bit. He was the light out of the tunnel for me and when I first read Cien Años de Soledad, I recognized that magical realism was my literary home. I am eternally grateful to the man. Gracias. Broke my heart. You did a good job here. Thanks, love. Hard one to write, but even harder one to live for La Supa. Wow, that’s powerful. Well written. this is such a moving and haunting poem. You clearly stand in witness and solidarity with this woman and her community, and thank you for sharing your her story (and the story of so many other indigenous women on our planet) through your painting with words. Thank you, EmaBee. I’m pleased that La Supa’s story touched you. I look forward to learning more about your Guatemalan project. All the best. Thanks for reading this post, sD. Such a hard one to write because I was so aware of how much Supa has suffered in her life and, you’re right, very emotional. thank you Dear Suanissmima, Your website is stunning and deeply moving, filled with great beauty, humanity and compassion. I am honored.